LittleFin’s Chronicle 3.4 aims to help you track, manage, and pay your bills, and to make your bill information accessible no matter which computer you’re using. It’s a perfect example of how a simple, well-designed application, suited for a specific use, can be better than an over-engineered, all-in-one tool designed for a multitude of tasks. To get started with Chronicle, you enter information about the bills you have to pay—the payee name, the dollar amount, and the due date—and then select the way that you'll be paying that bill: online, by mail, by phone, or using automatic withdrawal. You can also choose a small icon to represent the kind of bill you’re paying—for example, an icon of an automobile for a car loan. For each bill, you can also set an optional reminder. Chronicle creates a due-date event in iCal with an alert, so you’re notified several days in advance of the bill’s due date. 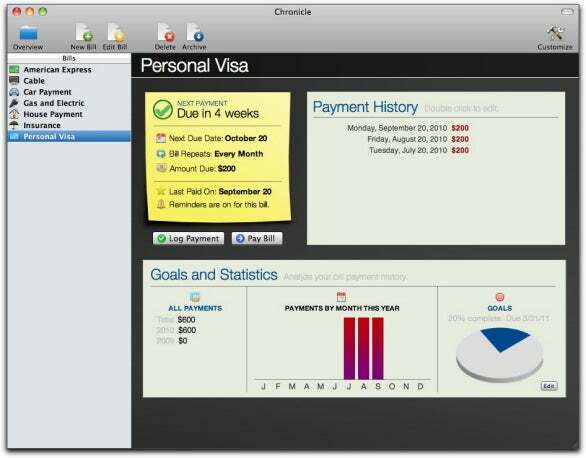 Once you create a bill, it appears in your bill list on Chronicle’s summary screen. This screen provides an overview of all your bills, how much you’ve paid out during the current month, and, if you choose to add information on your monthly income, how much cash you currently have on hand. The summary screen also displays the number of bills and the estimated dollar amount due within the next 7 days. Double-clicking any bill on the summary screen displays information specific to that bill, including how much you’ve paid towards it during the past twelve months, when the next bill is due, and whether or not automatic reminders are set for that bill. If you’ve chosen to pay a specific bill online, and you’ve entered the Web address for paying that bill, Chronicle can open the Web page for you when it’s time to pay. Using instructions on the LittleFin Website—a button in the program’s Preferences window takes you to the Web page—you can configure Chronicle to store your data using Dropbox or MobileMe, making that data accessible from any computer with Chronicle installed. While Chronicle is great at keeping you on top of your bills, there are some features that I would love to see expanded a bit. First, for every bill you enter, you can choose to set a goal for paying that item off. So, for example, if you owe $1000 on a credit card, you can enter that current balance, a target balance, and the date you want to reach that target balance. Chronicle then presents you with a pie graph, updated automatically with each payment, displaying the percentage of your goal that you’ve reached. In principle this is a great idea, but Chronicle doesn’t go far enough here. It should display the debt's actual current balance and also take into account any interest you’re paying. This omission highlights an overall Chronicle weakness: It offers you no way to track how much money you owe your creditors. Chronicle’s second weakness is reporting. While the program provides three different reports—Current Year, Last Year, and All Years—these reports display only information for the money you’ve paid to individual creditors. You can’t display a total for all the money you’ve paid out in a year. Caveats aside, Chronicle offers a great way for you to keep tabs on your bills, making sure that you know when those bills are due and that they get paid.